« The Bush Admin’s Brilliant Solution To Mideast Crisis: Let Obama Deal With It! 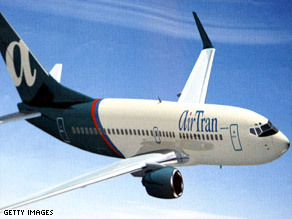 AirTran Airways officially issued an apology on Friday for booting a Muslim family off a plane for being, well, Muslim. The families of Atif Irfan, a tax attorney, and his brother Kashif Irfan, an anesthesiologist, along with their three small children, sister, and suspiciously Muslim friend were politely “escorted” off a flight in Washington Thursday after a terrorist-patrolling passenger reported hearing Atif Irfan’s wife say something suspicious. Or at least something suspicious if you and your family also happen to be wearing traditional Muslim headscarves and beards when walking through the aisle musing on the best place to sit in case of an accident, explosion, or other sort of emergency. Ha ha. Don’t be silly. Here in America that’s not only enough to get you and the other 8 Muslim-Americans in your party unceremoniously booted from the plane, but also barred from re-booking the flight, even after the FBI clears you of all charges and pleads with agents on your behalf. If you wanted the friendly skies, you should have gone United.